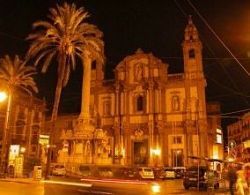 Saint Dominic’s Church in Palermo is the second in importance only to the Cathedral and is located in the Saint Dominic square,in the neighborhood of La Loggia. The origin of the Church dates from 1458, perceptible in some Renaissance style, but the current configuration is more recent, dating back to 1640, when architect Andrea Cirrincione made the major changes, except for the facade that was built later, in 1726. In 1853 the church became the pantheon of illustrious Sicilians who began to be buried in it, and also today the church today is the more representative of the noblest men. Its central location also among the city's main street, Via Roma and the homonymous square overlooked, have helped to increase its importance. Recently the church has had a major renovation that has restored the original colors. The Baroque style is fundamentally dramatic, the gable is punctuated by two tall towers, on the façade there are also many plaster statues depicting saints and popes, some of which put in the inner recesses, by the grandson of Giacomo Serpotta, Giovan Maria Serpotta. Also on the facade are twelve columns, arranged in pairs, arranged in eight to frame the central area and the entrance, while the other four are placed at the base of the bell. The interior is very spacious and austere made with stone Billiemi, and inside are preserved some important works of art from the Baroque period, placed in niches. The interior consists of three naves separated by eight columns on each side according to the Tuscan style and the classic age. 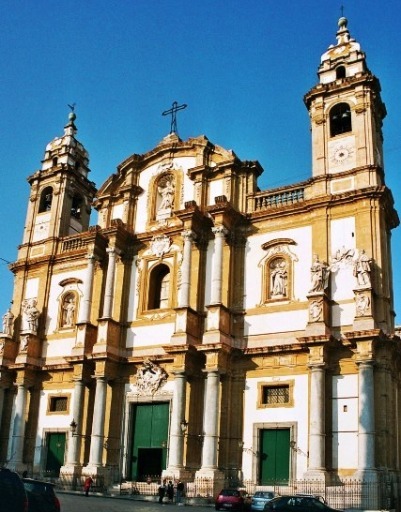 The Church of San Domenico is one of the largest churches of Sicily, but also one of the most representative of the Baroque age. The Church of San Domenico is part of our tours City sightseeing Palermo and Visiting Palermo 2 with lunch in a beautiful home in "Palermo Food Experience"